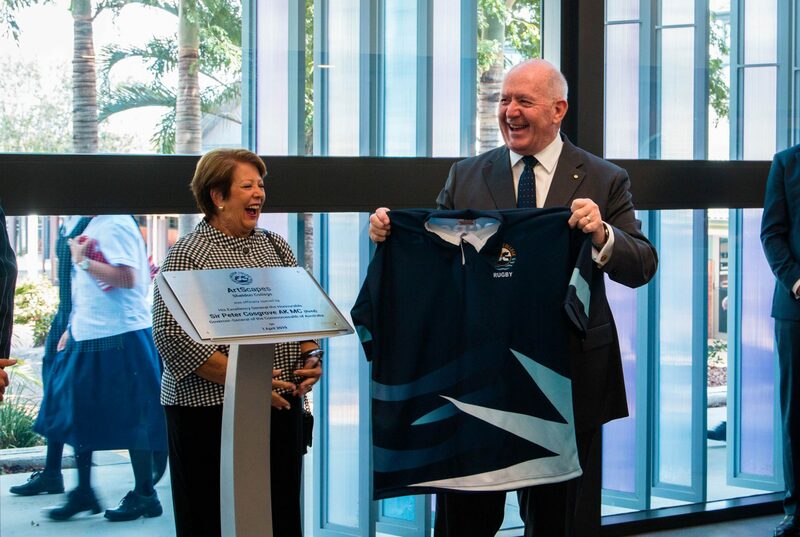 ArtScapes, the latest extension to the $15 million LINQ (Learning and Innovation for a New Queensland) Precinct, was officially opened by His Excellency General the Honourable Sir Peter Cosgrove AK MC (Retd) Governor-General of the Commonwealth of Australia and Her Excellency Lady Cosgrove on Monday, 1 April. 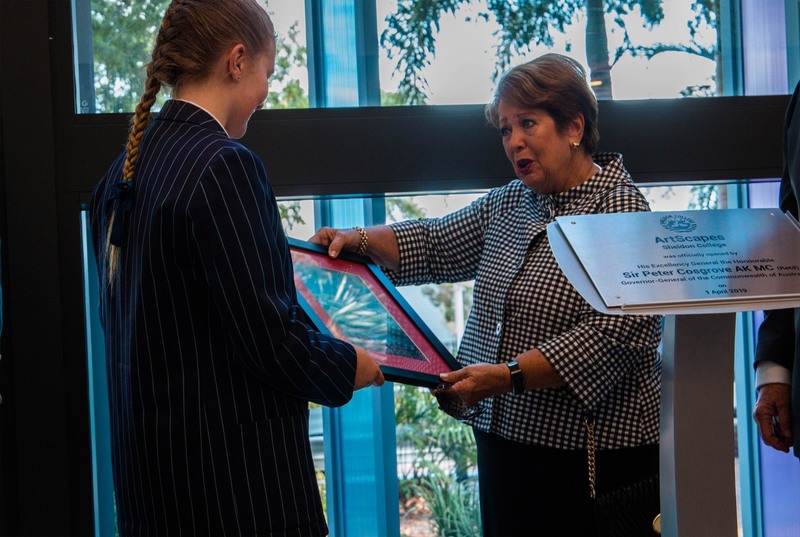 Their Excellencies, assisted by the College Captains, Taige Hooper and Zoe Moran, revealed the building’s plaque and cut the ribbon on the cutting-edge mixed media facility which features a dedicated Virtual Reality laboratory, digital art classroom, traditional art studios, and an art exhibition space featuring the Learning Galaxy – an interactive wall. Taige Hooper also presented the Governor-General with an official Sheldon College Rugby Jersey featuring his old number ‘7’ and Year 10 Australian School of the Arts (ASTA) Professionals Program student, Natasha Rees presented Lady Cosgrove with a piece of her mixed media artwork titled ‘Fly Away Home’. Throughout the Cosgrove’s visit to ArtScapes, students were engaged with activities showcasing the capabilities of the spaces designed to help facilitate the creative processes of Sheldon College’s Visual Art Makers, Digital Engineers, STEAM-preneurs and Media Composers. Year 4 students were communicating their historical knowledge through the curation of historically accurate artefacts using 3D modelling, virtual reality solutions and the 5m long interactive galaxy wall as part of their Living Museum project. 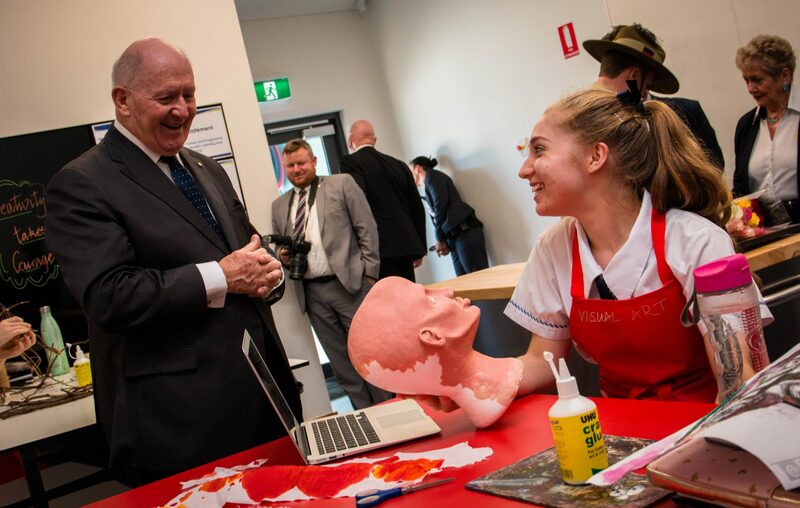 “The Governor-General and Lady Cosgrove witnessed an unprecedented level of engagement from our Year 4 students with the advent of new technologies and the use of flexible learning spaces. Our students showcased their learning in a variety of modes and through a range of contexts that reflect current and future educational trends,” said Mr Jade Frewin, Academic Staff – Faculty of Technology. Year 6 Visual Art Students explored the different techniques of traditional print making and of ceramic clay sculpting to the theme of insect invasion. These areas of study were designed to encourage the students to engage with the design processes of realism, stylisation and abstraction. Year 12 students worked on a self-directed inquiry learning model focused on multimedia adaptation. This project required the use of both traditional and contemporary art styles. The Digital Art studios were also showcased with Year 11 and 12 Australian School of the Arts (ASTA) Professionals Program students working across digital software to develop complex artworks. 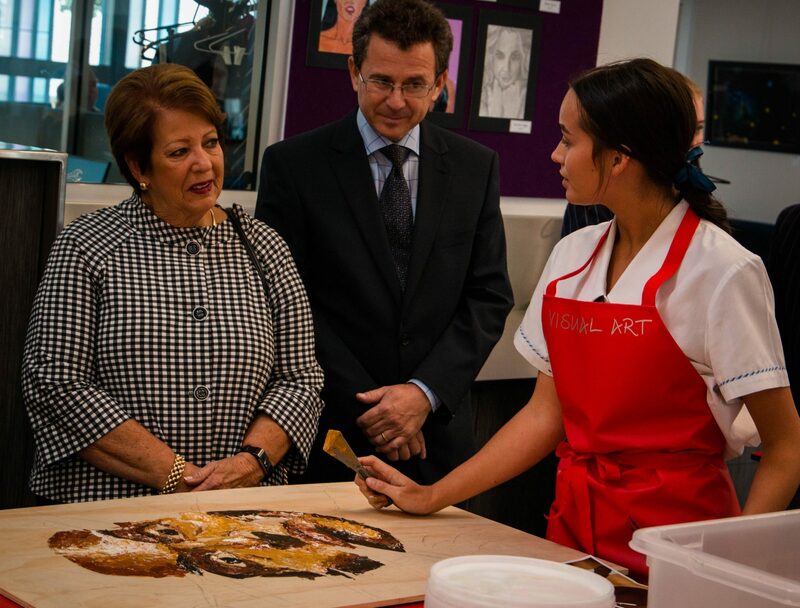 “Both the Governor-General and Lady Cosgrove spoke to the students about their creations and were impressed with the authenticity of their learning,” said Mr Josh Hanek, Academic Staff – Faculty of the Arts. This was a wonderful experience for the students and teachers alike, who not only got the opportunity to speak with Their Excellencies, but also had the opportunity to show them where they work, learn and explore daily.